Walt Disney Co. reported quarterly earnings on Feb. 5 that handily topped Wall Street estimates thanks to a booming theme park business and growth at its ABC broadcast network as the company invests in a digital media future. Disney, whose media properties include ESPN and the Disney Channels along with ABC, is trying to transform into a digital entertainment company to compete with Netflix Inc. and other online video outlets that deliver programming directly to customers. The new streaming services include Disney+ and ESPN+. By saving content for its own platforms, Disney estimates a decrease in year-over-year operating income of $150 million this fiscal year because it will forego licensing revenue from others, Chief Financial Officer Christine McCarthy said on a conference call. For the fiscal first quarter that ended in December, Disney reported adjusted earnings per share of $1.84. Analysts on average had expected $1.55, according to I/B/E/S data from Refinitiv. Disney has reorganized its divisions for its streaming future, and the Feb. 5 earnings report was the first to reflect the company’s new structure. Operating income at the media networks unit, Disney’s largest, rose 7 percent from a year earlier to $1.3 billion. The ABC broadcast division saw profit jump 40 percent thanks to growth in affiliate fees, advertising revenue, and program sales. The theme parks and consumer products division reported profit of $2.2 billion, up 10 percent from a year earlier. 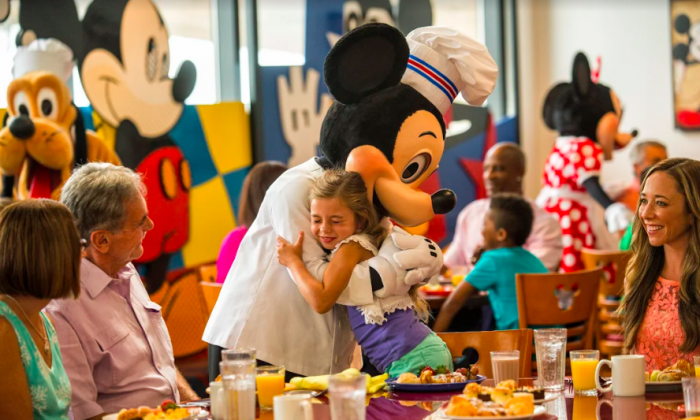 Results were buoyed by increased guest spending and higher occupancy rates at Disney’s U.S. theme parks. “Disney’s earnings momentum shows that the company will be entering a highly competitive video-streaming market from a position of strength,” said Haris Anwar, senior analyst at Investing.com. “If its existing media assets are churning out good cash and it’s able to contain its costs, the video streaming push later this year should make investors excited and help the stock to get out of its current sluggish spell,” he said. The ESPN+ streaming service has signed up 2 million paying subscribers, Disney’s chief executive, Bob Iger, said on the conference call. That is double the number five months ago. Nearly 600,000 of those new customers joined ahead of the service’s first UFC Fight Night mixed-martial arts contest, Iger said. Overall, Disney’s adjusted earnings-per-share declined 3 percent for the quarter from a year earlier as profit fell at the company’s movie studio. A new division, direct-to-consumer and international, reported a $136 million loss for the quarter. That included spending to set up Disney+, a streaming service for family entertainment that the company plans to debut later this year. As part of that effort, Disney will withhold programming such as upcoming movie “Captain Marvel” from Netflix. Disney also is in the process of buying film and TV assets from 21st Century Fox Inc to expand its portfolio. That deal will give Disney a majority stake in Hulu, which the company aims to offer alongside Disney+ and ESPN+. Iger said it is possible Disney may offer discounts to people who buy more than one of the three streaming services.